Everyone has traveled on Amtrak before. Amtrak provides service in forty-three states, with 21 major routes. Amtrak Guest Rewards is one of the finest passenger loyalty programs in the travel industry. It allows avid Amtrak travelers to earn points for every trip and every dollar spent on ticket purchases. With the Amtrak Guest Rewards Mastercard, avid Amtrak travelers can accrue maximum points per dollar with a multitude of merchants. 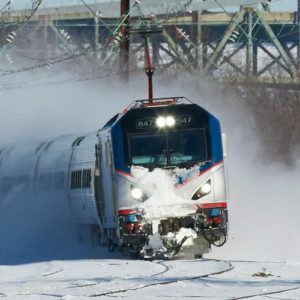 How many merchants are in partnership with Amtrak Guest Rewards? Amtrak Guest Rewards members will be surprised. For all Amtrak Guest Rewards members, it pays to keep ‘track’ of participating merchants on a consistent basis. When traveling on on board any Amtrak train, it is a huge plus to be a member of the Amtrak Guest Rewards program. For each and every trip, passengers earn points based on the distance. Being a Amtrak Guest Rewards Mastercard holder, there are even more benefits. Amtrak Guest Rewards members are encouraged to log into their accounts online on a monthly basis. Each and every Amtrak Guest Rewards member has a ten-digit membership number-just like airline travelers have their own frequent flyer number. Having logged into their online Amtrak Guest Rewards account, members can view their point balance at a glance. 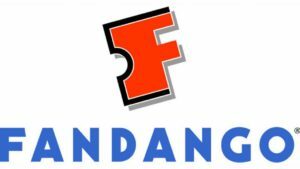 Amtrak Guest Rewards members can earn six points per dollar when they purchase movie tickets via Fandango. While logged into their accounts, the most important thing for all Amtrak Guest Rewards members to do is to stay updated on the the listing of participating merchants. Each of the participating merchants reward Amtrak passengers a certain amount of points per dollar when they make any purchase. What are some of the Amtrak Guest Rewards participating merchants with the highest points per dollar values? With Fandango, members earn six points per dollar. Members earn eight points per dollar with any Kiehl’s purchase. Members earn nine points per dollar at Luggage Guy. At Lonely Planet, members earn eleven points per dollar. As long as they use the Amtrak Guest Rewards Mastercard, the points are theirs. Points from Amtrak ticket purchases take up to three weeks to post to members’ accounts. Points from all other purchases take up to six weeks to post. On a wintry day, an Amtrak Northeast Regional train races southbound through New London, Connecticut. Amtrak Guest Rewards also gives its members the opportunity to accrue maximum points with a variety of hotels, such as La Quinta, Hilton, and Wyndam. Amtrak Guest Rewards members can also earn points when they fly United Airlines. When Amtrak Guest Rewards members fly on United Airlines, they can earn Amtrak Guest Rewards points on qualifying United Flights in and out of Newark International Airport. Using the Amtrak Guest Rewards Mastercard turns those flights and hotel stays into instant points toward a well-deserved train journey. Traveling on Amtrak is not just convenient, it’s rewarding! Amtrak Guest Rewards doesn’t just allow avid Amtrak travelers to earn points for every trip on the rails. It allows Amtrak travelers to earn maximum points towards a free trip on the rails. Logging on to their Amtrak Guest Rewards accounts online on a monthly basis enables Amtrak travelers to keep ‘track’ of their point balance. Ultimately, members can view what merchants, hotels, and other commercial services are rewarding the most points to keep them riding and smiling. 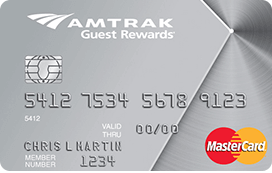 The Amtrak Guest Rewards Mastercard makes these maximum points possible. Amtrak Guest Rewards is the passenger loyalty program empowers Amtrak passengers to go the “extra mile” to earn that free trip in the near future. At Amtrak they say “Let the journey begin!”. At Amtrak Guest Rewards, the journey is never-ending.